T-L Photo/RICK THORP Harrison Central shortstop Kobe Mitchell makes a throw to first during the Huskies’ baseball game against Coshocton on Tuesday at Robert Mazeroski Memorial Field. Andrew Clelland scored on a passed ball in the fifth inning and the Huskies, prevailed, 4-3. CADIZ — Andrew Clelland raced home from third on a passed ball with two out in the fifth inning Tuesday with what turned out being the winning run as Harrison Central bested Coshocton 4-3 at Robert Mazeroski Memorial Field. 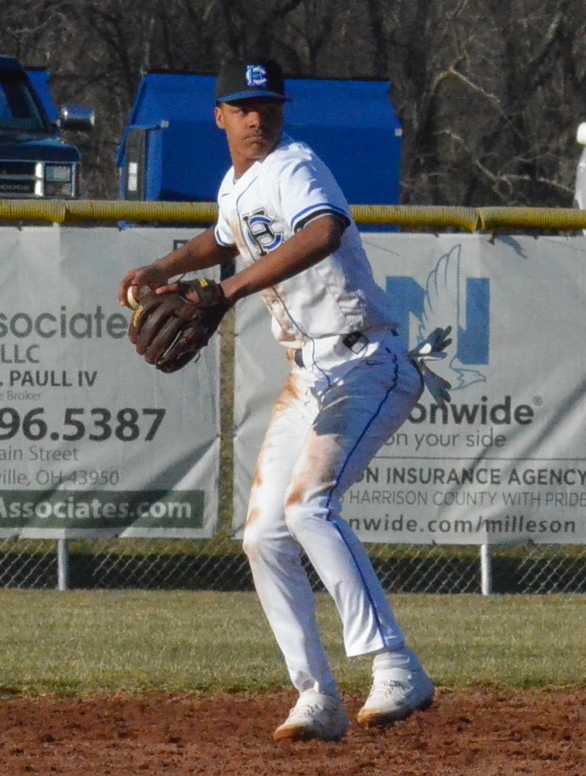 The Huskies improved to 2-0 on the young high school baseball season by pocketing their second one-run triumph in four days after edging Buckeye Local, 6-5, in the season opener Saturday, also at home. Cameron McIntosh earned the complete-game victory for Harrison Central, allowing five hits and striking out three and walking one. McIntosh yielded a run in the first, but the Huskies rallied with two in the bottom half of the inning. With one down, Clelland sent a shot off the fence in left, bringing Cruz Capers around from first tying the game. Later, after the Ohio State commit moved to third on a groundout, he came home after Kobe Mitchell reached on an error. The miscue was one of four on the day for the debuting Redskins and seven all told in the game. Harrison Central committed a pair in the fourth that helped Coshocton tie the game at 3-3. Coshocton tied the game in its half of the second on an RBI single by cleanup hitter Zach Crown that scored Griffin Mason from second. The Huskies regained the lead in the bottom half of the inning thanks to some two-out magic. Logan Tonkovich, the Huskies’ own cleanup batter, doubled to right with two gone. Mitchell followed with a shot up the middle. Tonkovich raced home and crossed the plate just before Mitchell was tagged out trying to stretch a single into a double. In the bottom of the fifth, Clelland reached second after Coshocton’s right fielder misplayed a fly ball. Tonkovich reached first moments later on another error, which allowed Clelland to move to third. With two away and McIntosh at the dish, Clelland scored on the passed ball. And, from there, McIntosh went back to the mound and dominated, allowing just one baserunner on a two-out hit in the seventh. The Huskies finish the Buckeye 8 home-and-home with Buckeye Local today.